The next Women's Boxing Awards beginners course starts on the last Tuesday in September and runs over 8 sessions (break at half term if necessary). It's a great introduction to the boxing gym and a chance to learn some basics before launching into fitness classes or stepping into the ring. 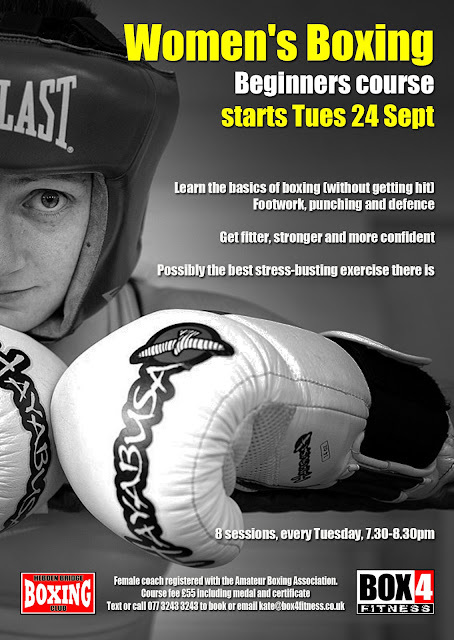 This course covers the basics of boxing and involves light fitness training. Each session begins with preparation for training; warming up, skipping, bodyweight exercise and drills. You'll learn a new technique each week and drill it the following week so that at the end of the course, movement and punching is becoming more natural. Absolute beginners who have an interest in either competing in Amateur Boxing or those who want to benefit from the training, for fitness only. There's always a mixed group of varied abilities and ages, providing an all female, supportive environment. As a big sissy who doesn't like too much activity, I can say I am truly converted. Kate's classes are great - they are fun, you improve your fitness and learn the basics of technique that will take you further on in boxing if you're interested. This is the only class I've ever stuck with. Who knew exercise could be fun too! (Check out the other classes going on in the gym too. They are guaranteed to make you break a sweat). No further Box 4 Fitness Juniors sessions.